In collaboration with the designers at SAOTA, Acoustic Architects has expertly automated another stunning Miami residence. Located on exclusive Di Lido Island, the appropriately named Di Lido house is an architectural work of art. 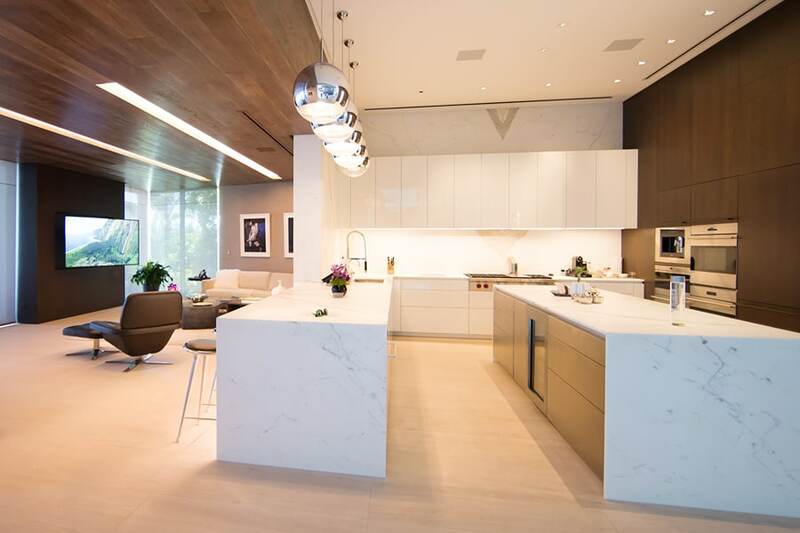 Completed in 2018, this alluring single-family residence has attracted attention from numerous journalistic reviews as a must-see site in one of the most coveted areas of Miami. 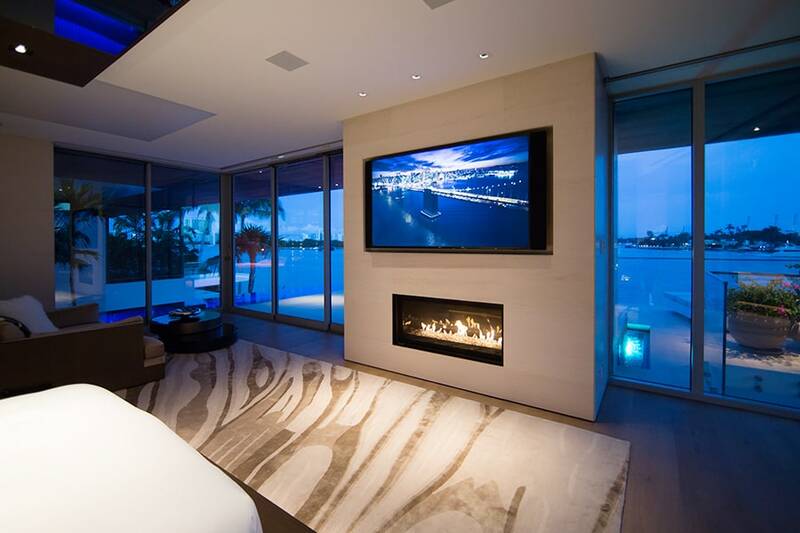 The Di Lido residence is perfectly highlighted at every turn with Lutron QS lighting. From the ceiling to the floors, intentionally placed lights direct attention to the residence’s most important architectural features. One touch and voice controls seamlessly adjust brightness and lighting scenes. Accent lighting directs attention to the magnificent art pieces placed throughout the home. With grand windows in almost every room of the house, natural light flows in by day changing to a scenic view of the night sky at dark. Automated Lutron QS shades provide filtration for the sunlight and privacy at all hours of the day. Shades are controlled by voice or touch activation for complete ease of adjustments. Smart HD TVs on the walls of the living room and bedrooms are integrated into the central smart system. Wires are completely hidden in the walls. Strikingly thin glass panels are engineered for crystal clear picture. The TVs blend into the interior design when not in use. When activated, they provide mood-enhancing visuals. Invisible speakers are hidden throughout the Di Lido residence for musical ambiance on demand. The dining room and walk-in closets include recessed backlighting to illuminate the contents of storage spaces. In the dining room, wines are showcased from floor to ceiling, highlighted from behind, for an earthy and sultry dinner experience. In the closets, contents of the shelving can be easily seen due to the thoughtful lighting design. The technology is neatly tied together and operating from a central control hub hidden in sleek aesthetically pleasing panels, out of sight. Maintained by expert integrators, the technological features of the residence add value and depth to the architectural brilliance that has captivated the heart of so many. Di Lido is truly an example of finest in Responsive Living with masterfully designed home automation. Responsive Living, the term coined by Acoustic Architects founders, Aaron Flint and Spencer Hauldren, is the concept of seamlessly enhancing the client’s unique lifestyle using smart home technology. Responsive Living allows you to interact with your space via touch input, voice command, and predictive automation, placing you in full control of your home. If you would like to learn more about home automation, feel free to connect with us. We will be happy to schedule a demo with you. Like what you read? Spread the word and share on LinkedIn.